Using a company could save you over £10,000 in tax every year... and possibly much more. Why? Because a company paying tax at 19% will have a lot more money left to reinvest than a sole trader or partnership paying tax at 42% or 47%. However, company owners also have to pay income tax when they extract money from their companies and the recent increase in dividend tax rates means that a company will not deliver worthwhile tax savings in every situation. The 19th edition of Using a Company to Save Tax was published in November 2018 and is completely up to date for the current tax year. It tells you everything you need to know about the benefits and drawbacks of using a company. Anyone thinking of setting up a company. All sole traders and partnership businesses. Accountants who wish to advise their clients on the tax benefits of using a company. Excellent. Well worth the time invested. This book is excellent. Written in plain English without any technical jargon, it is easy to read and understand. It contains plenty of tax saving tips and tables to give you an idea of the tax implications of operating your business as a sole trader or a limited company shareholder. Divided into 38 Chapters, each of which could be read in isolation, meant that some of the ideas were repeated over and over again,which is not necessarily a bad bad thing. I would highly recommend it, especially for anyone looking to start a new business and not sure whether to trade as a Limited Company or a Sole Trader. Clear introduction to eliciting potential Company tax savings. Illustrative style promotes understanding. Use of tables provides further clarity and enhances explanations. References to recent and upcoming tax rates/changes were found to be useful and may facilitate future tax planning strategies. In summary, book is viewed as a valuable resource. Excellent Book. Strongly recommended. Especially if you are looking to decide if you are a sole trader or a limited company. It does a detailed comparison between both, looking at multiple different scenarios and situations. Very good. Two recent tax changes will have a big impact on company owners in the years ahead. First, the corporation tax rate was reduced from 20% to 19% in April 2017 and will be reduced to 17% in April 2020. This is great news for company owners who want to grow their businesses because they will get to keep more of their profit. Second, the tax payable on dividend income increased significantly on 6 April 2016. This is bad news for company owners who extract most of the profit from their businesses. The guide weighs up these two big tax changes and helps you decide whether using a company is still worthwhile. It contains numerous tables showing the potential tax savings at different profit levels. Although dividend tax has increased, the guide also shows how company owners can control how much income they withdraw from their companies and avoid the higher tax rates that kick in when income exceeds £46,350, £50,000, £100,000 or £150,000. Company owners may also find it easier to split their income with other family members. How companies are taxed - in plain English! The tax and non-tax benefits and drawbacks of using a company. A clear comparison of company tax and sole trader/partnership tax. A plain English guide to how dividends are now taxed with lots of examples. How company owners can avoid paying 32.5% and 38.1% tax on their dividends. Examples showing the exact tax savings you could enjoy by using a company. Why using a company will increase your tax bill in some cases. How to save thousands in tax by bringing your spouse or partner into the company. How company owners can protect their child benefit payments. The benefits and dangers of using more than one company. How company owners can increase their tax savings by tens of thousands of pounds by keeping money inside the company. How company owners can pay just 10% capital gains tax when they wind up their companies... plus new anti-avoidance rules. How Scottish company owners can completely avoid higher income tax in Scotland. Future tax changes affecting business owners. How to incorporate an existing business, including how to make sure you pay zero capital gains tax and stamp duty land tax. The guide also contains many useful tables which show the exact tax savings enjoyed by company owners at every profit level. These tables take account of ALL taxes: income tax, corporation tax, national insurance etc. Dr Nick Braun founded Taxcafe in 1999. Over the past 18 years the company has become one of the UK's best-known tax publishers and has won several prestigious business awards. Nick has been a specialist tax writer since 1989, first in South Africa where he edited the monthly Tax Breaks publication, and since 1999 in the UK, where he has authored several tax books. Nick also has a PhD in economics from the University of Glasgow, where he was awarded the prestigious William Glen scholarship and later became a Research Fellow. When you order this guide you will also receive a FREE copy of How to Save Tax 2019/20. This comprehensive tax guide contains 174 pages of tax saving tips. It is completely up to date with all the latest tax changes announced in the October 2018 Budget, the March 2019 Spring Statement and all previous Budgets - essential reading for anyone who wants responsible, tried and tested tax planning ideas. 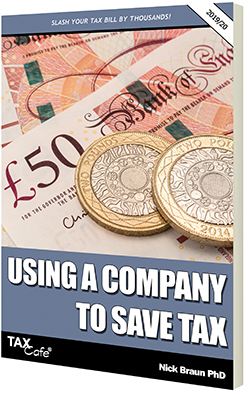 Using a Company to Save Tax - 184 pages of tax saving ideas. Professionally printed by one of the UK's leading book printers.